*Quote from The Education of Henry Adams. If you’ve read the Freakonomics transcript of Cass Sunstein and Richard Thaler discussing Nudge, you may have noticed the two curiously different author photographs. Thaler’s is a relatively recent, professional, tightly cropped color photo from the neck up. 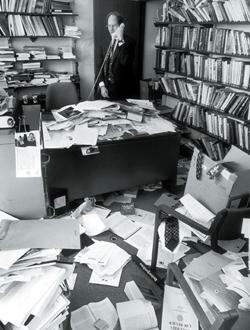 Sunstein’s, meanwhile, is a black-and-white wide-shot of him talking on the phone in his office (as if he is oblivious to the camera) amidst a clutter of papers and books. Sunstein’s photo is reprinted here for those who missed it. To see the other five offices, including Nobel Prize Winner Robert Fogel’s and McArthur Fellow John Eaton, click here.